The other week I had my friend Sarah staying over and while she was hunting around for a cleanser, we got onto the subject of beauty bloggers and people who recommend products. She wanted something to remove her foundation and other than eye make-up removers and my Liz Earle Cleanse and Polish I didn’t really have a lot to offer because I don’t tend to really use them (bad I know, but I find the detergent in most soaps and cleansers tends to strip my skin and leave it feeling parched). When it comes to beauty, I always think I’m a bit of a novice. I’m never the one in the know for new brands or the latest treatment and I’m fairly uniform in my routine. But Sarah told me that I was always a person who she’d ask about products, and when I asked why (because I’m definitely no expert) she told me that it was because she knew I’d tell the truth. 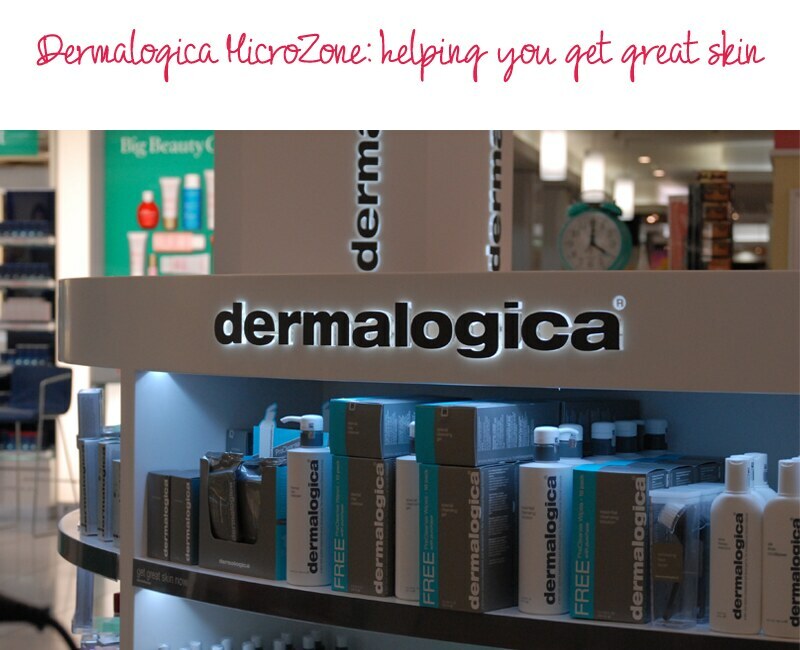 So in the spirit of spreading good word about things that work, I thought it was about time to post about my recent afternoon with the Dermalogica girls in Fenwick, after being treated to one of their microZone skin treatments. I wanted to hold off posting this straight away, to see how my skin reacted to the product. It seemed only right that after seeing great results almost immediately, I waited a little while to see the benefits and give Dermalogica my seal of approval. But I think it’s pretty safe to say that having been faithful to Clinique for the past ten years, I’m now a convert. Dermalogica is a brand I’ve heard a lot about but I wasn’t really sure about their ethos of using naturally acidic products – having been so used to the Clinique approach. 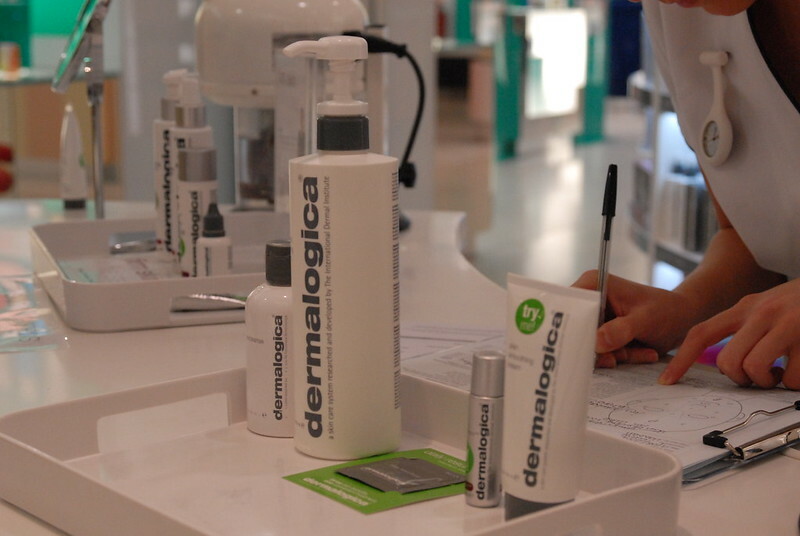 Since the skin is naturally acidic, Dermalogica developed their products to suit. Whereas brands like Clinique use more alcohol and alkaline, working in opposition to your skin’s PH. It sort of makes sense that you’d want something working with your skin, rather than against it, but it’s not something that I’d ever really thought about. After meeting Katie, my Dermalogica skin therapist, and chatting she explained that the Dermalogica approach was more focused on getting great skin in the long term, not a quick fix solution. So confession time: I’ve never had a facial. But really I probably still haven’t, since Dermalogica don’t like to refer to their treatments as facials. They don’t provide an off the shelf ‘sort your skin out’ solution, instead each treatment is tailored specifically to your skin’s needs. When I got to the Dermalogica counter, Katie started off with a consultation and skin mapping session. We went through my main concerns, (dry skin and scarring from picking my face..), and how to target them. After a brief chat, Katie agreed that one of my main skin issues is that my face is very dry and generally dehydrated, so set to work identifying a custom treatment that would target that. As well as addressing the post inflammatory pigmentation (from picking spots and causing them to scab. Bad habit!) and how best to reduce the scarring. Katie started with the PreCleanse, an oil that you massage into the skin and then dampen with water to create a milk. This was quickly removed and followed by Essential Cleansing Solution, a slightly more creamy, nourishing cleanser that left my skin feeling polished. Cleansing is a really important part of any great skincare regime because it’s critical to skin health. The concept behind the double cleanse is to use the oil to remove excess makeup and take off the day, then the creamier cleanser leaves your skin feeling its cleanest ever. After cleansing and giving the skin a quick examination, she decided on a course of treatment, applying a thick mask. One thing that I find really interesting about the treatments is that they blend their products together, so the solution applied to my face was designed for my skin needs. After creating a mask and painting it onto my face, Katie asked me to hold onto this electrode thing. 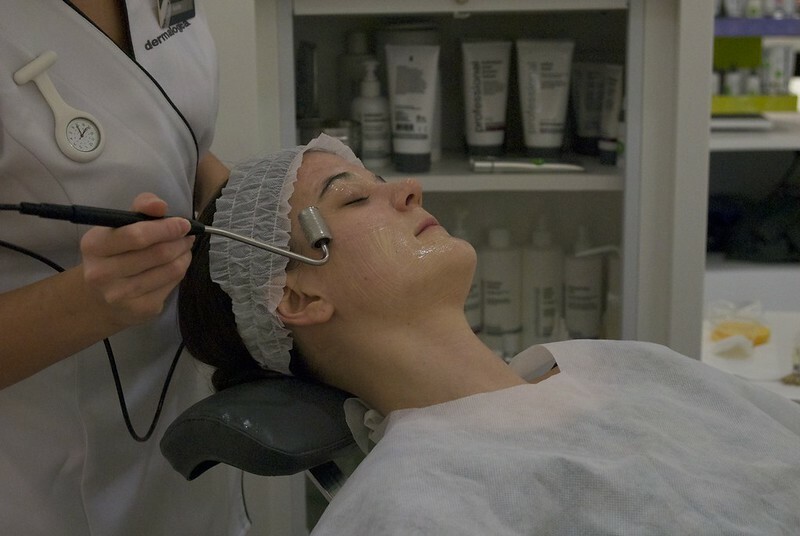 The concept behind it is that it uses a positively polarized continuous current in conjunction with ionically charged facial mask product to allow absorption of its nutrients to the skins dermal layer. So the two positive charges repel each other, pushing the product deeper into your pores, where it will stay for at least the next 5 days and work its magic. Although it was a bit strange at first, the coolness of the mask and roller felt amazing on my skin, and after it was removed I could feel how hydrated my skin was. Although I’m pretty good with moisturising, one thing I always tend to neglect though is exfoliant. I know I should exfoliate, but having such dry skin, I’m naturally put off using any abrasive product. To address this, Katie introduced me to Daily Resurfacer, a combination of alpha and beta hydroxy acids and enzymes which work to smooth the skin. I’ve not used any sort of acid or enzyme exfoliant so I was a bit nervous that it might feel a little strange, but Katie reassured me that it was actually more gentle on my skin than abrasive exfoliants. It felt slightly tingly on the skin, but amazing once I’d had the Skin Smoothing Cream applied. Afterwards, I could feel my skin literally glowing and it definitely made me feel more inspired to take care of what I was eating for the rest of the day and drink loads of water. At only £20 a pop for the treatment, I’ll definitely be going back in a few weeks (I even bought my Mam a voucher for one of the MicroZone treatments for Mother’s Day!).. as well of course as investing in some of the products. I left with a generous goody bag of samples so I could keep up the routine, and can honestly say my skin has never been in better condition.. although now I’m all out, I’ve noticed that I’m starting to break out again. So it seems like the right time to make the investment and switch my skin care regime. I’d never thought about it before, but skin care is very much like haircare, in that every 6 weeks or so, you need to give it a little TLC, whether that’s at home or at the hands of a professional. If I’ve tempted you to try it out, give Fenwick a call and get yourself booked in! Twenty quid is a small price to pay for great skin and half an hours worth of pampering..
Wow this looks amazing, I admit I don't have a skin care routine at all. I would love to try this though.